On this lunchtime bike ride I returned to Historic Congressional Cemetery (MAP) on Capitol Hill, one of my favorite lunchtime biking destinations. I like it because even after numerous rides there, there is still so much more history within the cemetery to be discovered and learned. 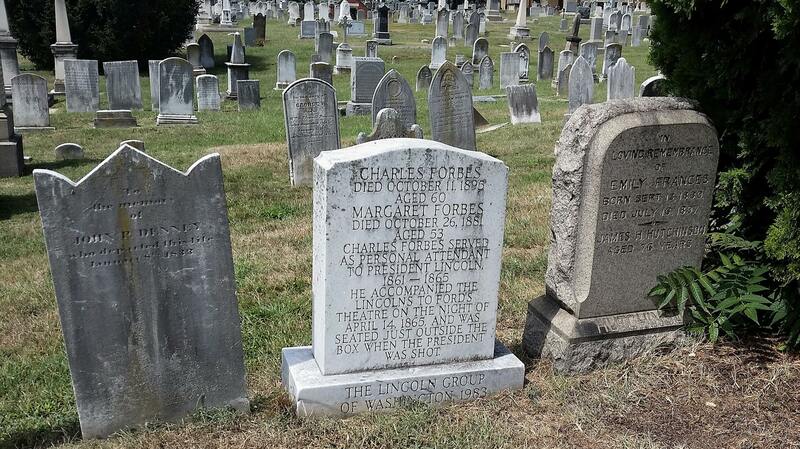 This time I visited the grave of Charles Forbes, who I often think about whenever I make a mistake at work. Let me explain why. Forbes was born in Ireland around 1835 and at the age of 26 started working at The White House in 1861, shortly after President Abraham Lincoln’s first inauguration. He was one of several house servants assigned to President Lincoln. Quickly becoming a favorite with both the President and Mrs. Lincoln, Forbes became the personal attendant to the President, a position he held for approximately four years. He also occasionally watched out for Mary Todd Lincoln and Thomas “Tad” Lincoln III, as well. And it was during this time working for the President that Forbes made one of the biggest mistakes on the job that anyone has ever made. Forbes accompanied the Lincolns to Ford’s Theatre on April 14, 1865, the night that Lincoln was assassinated by John Wilkes Booth. That night Booth approached Forbes, who was seated outside of Lincoln’s box, and gave him his calling card. Forbes then allowed Booth to enter the door to the private box. Moments later the President was mortally wounded. Forbes remains a mysterious figure in the events of that night. He never gave a witness statement nor did he ever leave a written or verbal account of the assassination of the President. But Mrs. Lincoln remained fond of Forbes, bore him no ill will for the evening’s events, and later presented him with the suit of clothes that Lincoln wore that night. After Lincoln’s death, Forbes became a messenger for the U.S. Treasury Department and later for the Adjutant General’s office. He died October 10, 1885, at his home at 1711 G Street in northwest D.C., leaving his wife Margaret and a daughter, Mary. He was buried in an unmarked grave in Congressional Cemetery until 1984 when The Lincoln Group, a historical society, placed a marker on his grave. So it was this mistake on the job of Forbes’ that makes me glad that the mistakes I make at work never result in the consequences his mistake did. Even the worst mistakes I could possibly make don’t result in altering the course of history, as his mistake did. So when I mess up, I just think of him and this bike ride, and I feel a little better. Murals revitalize neighborhoods with nothing but a little spray paint and imagination. And an initiative named MuralsDC is spearheading this form of revitalization here in the national capital city. Sponsored by the D.C. Department of Public Works and conducted in partnership with the D.C. Commission on the Arts and Humanities and the non-profit Words Beats & Life, MuralsDC works with business owners in places that have been affected by illegal graffiti, and replaces the graffiti with free-of-charge artwork. And that’s is exactly what happened to create the mural that I saw on this lunchtime bike ride. It is entitled “Reloaded”, and is located on the side of the building located at 312 Florida Avenue (MAP) in northwest D.C.’s Truxton Circle neighborhood. “Reloaded” was created by one of D.C.’s most active mural artists, Aniekan Udofia, whose other local murals include: a portrait of Marvin Gaye surrounded by streams of color; one featuring a mermaid-like girl swimming in a sea of color at the William Rumsey Aquatic Center on Capitol Hill, and; a brightly striped mural featuring President Barack Obama and Bill Cosby that up until recently was featured on the side of Ben’s Chili Bowl. 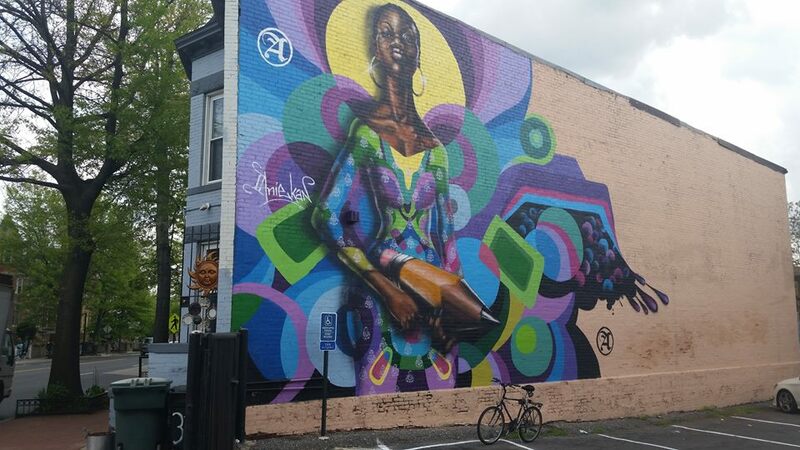 One of D.C.’s most eye-catching murals, “Reloaded” shows a curvy woman pointing a sharp pencil from her hips, almost like a weapon. And the pencil-as-weapon imagery seems to jump out of the wall, much like it jumped to the attention of the public when it was first planned. The Department of Public Works was cautious about the implication of a weapon, but nonetheless supported the choice of mural at the urging of Nzinga Damali Cathie, who works at Kuumba Kollectibles , the art gallery, gift store, and sweets shop located in the building that is home to the mural. Damali Cathie asserted, “We want people to focus on the true meaning of the weapon, the pencil, which is knowledge and literacy. [It’s] not a weapon that destroys at all, but more of a tool for building.” It has since become a neighborhood landmark, and received only positive feedback from visitors to Kuumba Kollectibles. 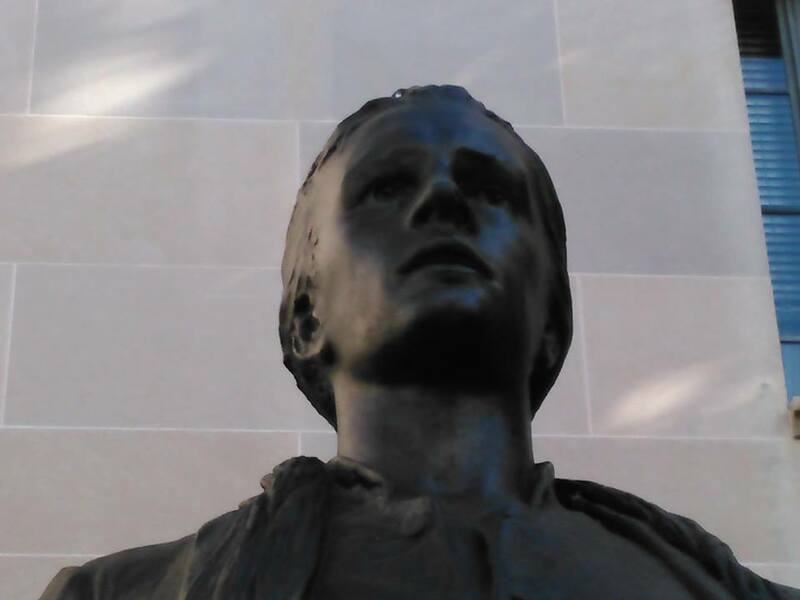 On this lunchtime bike ride I went to see a statue of Revolutionary War hero Nathan Hale, which is located outside of the Robert F. Kennedy Department of Justice Building, located at 950 Pennsylvania Avenue (MAP) in the city’s Downtown neighborhood. I went for two reasons. First, to see the statue itself. But the other reason I went to see the statue was to try to determine why it was located where it is. As far as I know, Hale was not a lawyer or connected in any way to the Justice Department or the Federal government. And he didn’t even have any known connections to D.C. So I was curious why the statue was placed where it is. 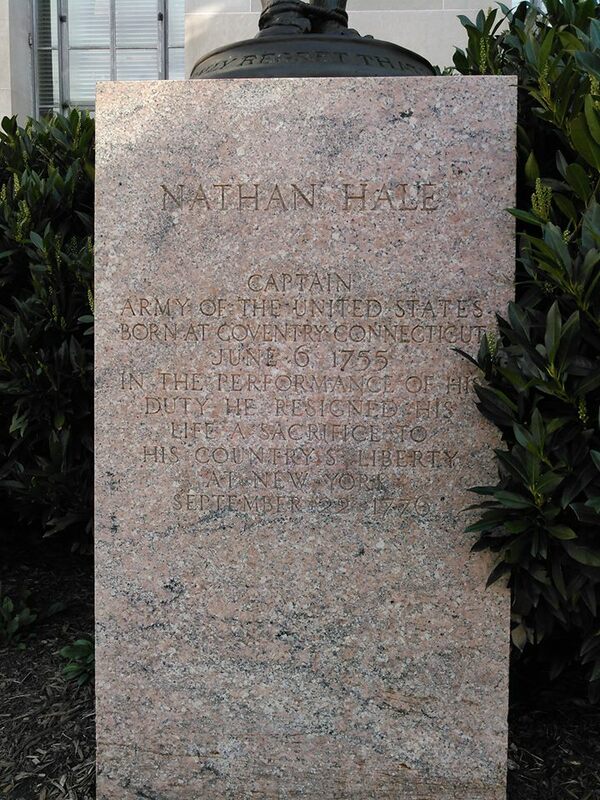 Nathan Hale was born on June 6, 1755 in Coventry, Connecticut. In 1768, at the age of 14, he attended Yale College along with his older brother Enoch. Hale graduated with first-class honors in 1773 at age 18 and became a teacher in Connecticut, first in East Haddam and later in New London. When the Revolutionary War began in 1775, Hale joined a Connecticut militia unit. His unit participated in the Siege of Boston, but Hale remained behind. It has been speculated by some that he was unsure as to whether he wanted to fight. On July 4, 1775, Hale received a letter from his classmate and friend Benjamin Tallmadge, and the letter was so inspiring that, several days later, Hale accepted a commission as first lieutenant in the 7th Connecticut Regiment. In September of the following year, General George Washington was desperate to determine the location of the imminent British invasion of Manhattan Island. To that end, he needed a spy for the Continental Army behind enemy lines. Hale was the only volunteer. During his mission, New York City fell to British forces, and Hale was captured. Hale was convicted of being a spy, and according to the standards of the time, was sentenced to be hanged the next day as an illegal combatant. While waiting for the sentence to be carried out, Hale requested a Bible, but his request was denied. Sometime later, he requested a clergyman. Again, his request was denied. The sentence was carried out the next morning, and Hale was hanged. He was 21 years old. Hale is best remembered for a speech that he gave just prior to being executed. It is almost certain that his last speech contained more than one sentence, but it is for the following sentence that he is best remembered. His last words before facing the gallows were famously reported to be, “I only regret that I have but one life to lose for my country.” Subsequent to his execution, Hale’s body has never been found. The original statue honoring Hale was created by American sculptor Bela Pratt in 1912, and stands in front of Connecticut Hall where Hale resided while at Yale. 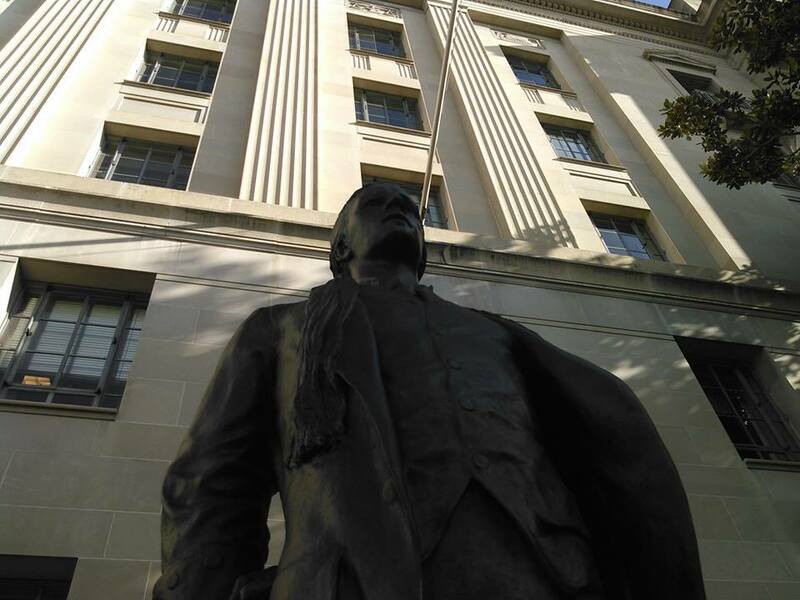 The statue located at the south façade of the Justice Department building near the corner of 10th Street and Constitution Avenue is a copy of this sculpture. 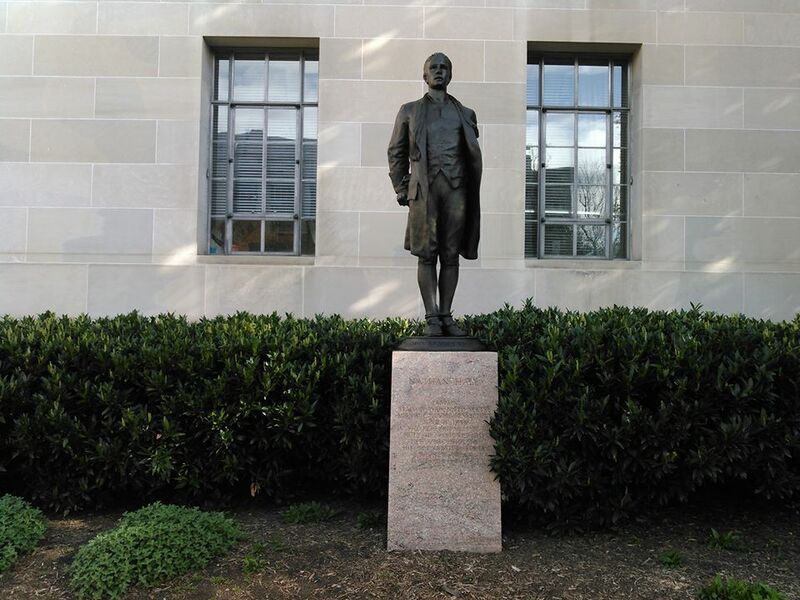 The D.C. statue is also part of the “American Revolution Statuary”, a group of fourteen statues in D.C. that are scattered across the city, mainly in squares and traffic circles. They are listed as a group on the National Register of Historic Places. Unfortunately, despite visiting the statue and researching it later, I still have no idea why it is located where it is. So if you know why, or have a theory, please feel free to share it in the comments section below. It was great early-spring weather for a bike ride today. There was no longer any sign of the recent cold, rainy conditions that took away the cherry blossoms. Instead, the skies were clear. There was a slight breeze. And the temperature was just warm enough to hint of summer’s approach. So on this lunchtime bike ride I rode over to Arlington National Cemetery (MAP), and went for a long walk on the grounds. And it was during this walk that I visited the Beirut Barracks Memorial. The Beirut Barracks Memorial honors the 241 American servicemen, comprised of 220 Marines, 18 sailors and three soldiers, who were killed in the October 23, 1983 terrorist bombing of the Marines barracks in Beirut, Lebanon. The bombing occurred during the Lebanese Civil War, when two truck bombs carrying what the FBI called the largest non-nuclear bomb in history, detonated by suicide bombers affiliated with a splinter group of the Iranian-and Syrian-supported Hezbollah organization, struck separate buildings housing United States and French military members of the Multinational Peacekeeping Force in Lebanon killing the U.S. servicemen, as well as 58 French peacekeepers, six civilians, and the two suicide attackers. 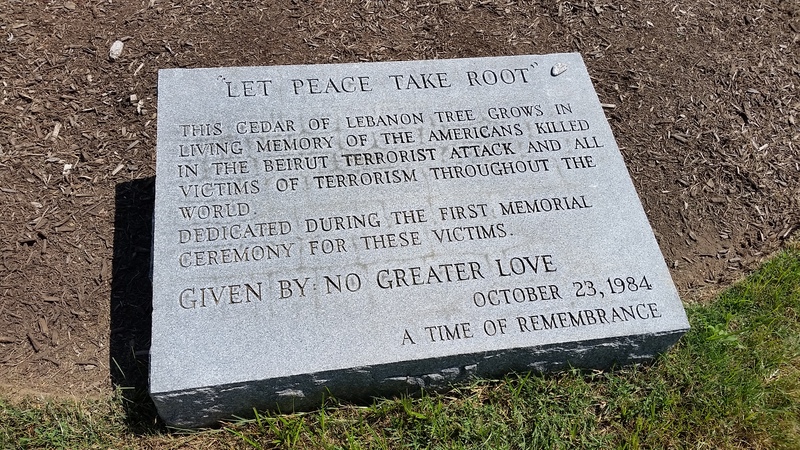 The memorial consists of a Lebanese cedar tree and a stone marker which reads, “‘Let Peace Take Root’ This cedar of Lebanon tree grows on living memory of the Americans killed in the Beirut terrorist attach and all victims of terrorism throughout the world. Dedicated during the first memorial ceremony for these victims. Given by: No Great Love. October 23, 1984. A Time of Remembrance.” And it is located in the green expanse of Arlington National’s Section 59, near the final resting place of some of the first Americans to shed blood in the fight against Middle East terrorism. 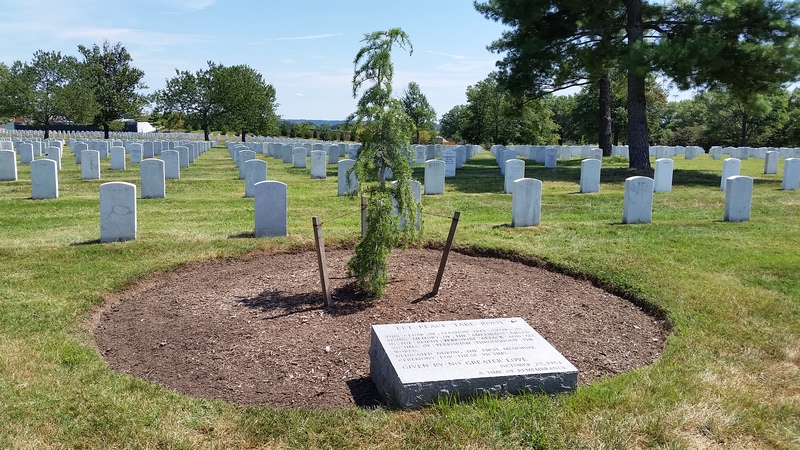 Twenty-one service members who lost their lives in the Beirut Barracks Bombing are also buried in Section 59 near the memorial. Perhaps the National Capital City’s biggest attraction in early Spring is the blooming of the historic cherry trees surround the Tidal Basin, the National Mall, and the Potomac waterfront. Visitors come from all over the world to witness this annual spectacle of nature. However, the blooms last a very short time. Any given tree may be in full bloom for only about a week. And it has now been more than a week since the blossoms peaked. During the intervening time the remaining blossoms continued to fall off the trees. And then almost all of those that were left succumbed to the rain and wind over the past weekend. But just because we will have to wait until next year for the cherry blossoms to return, visiting the trees near the Tidal Basin is still worthwhile. 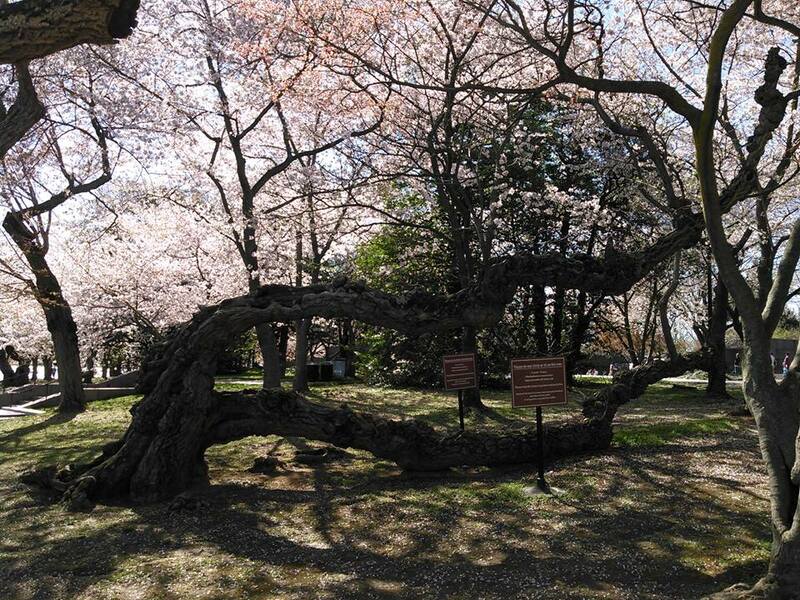 The twisted and gnarled trunks of the 3,750 cherry trees are ornamental in and of themselves. And like their blossoms, flowering cherry trees themselves are fairly ephemeral too, at least as trees go. Most cultivars live only 30 to 40 years. But quite a few of the trees surrounding the Tidal Basin were originally planted more than 100 years ago, and their age only contributes to their beauty. 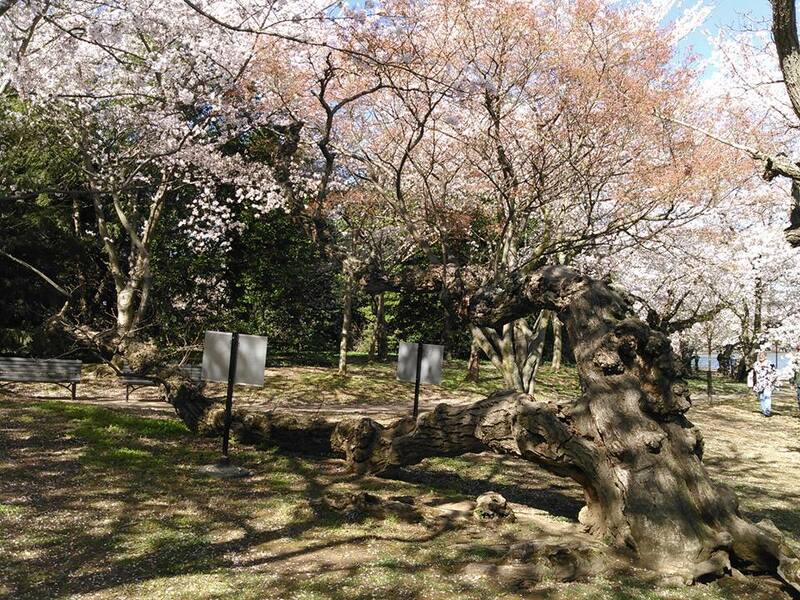 There are other trees mixed in with the more famous cherry trees that are worth seeing too. Flowering trees include dogwood, holly, magnolia, and crabapple trees. Other trees include American Elms, Red Maples, River Birches and pines. 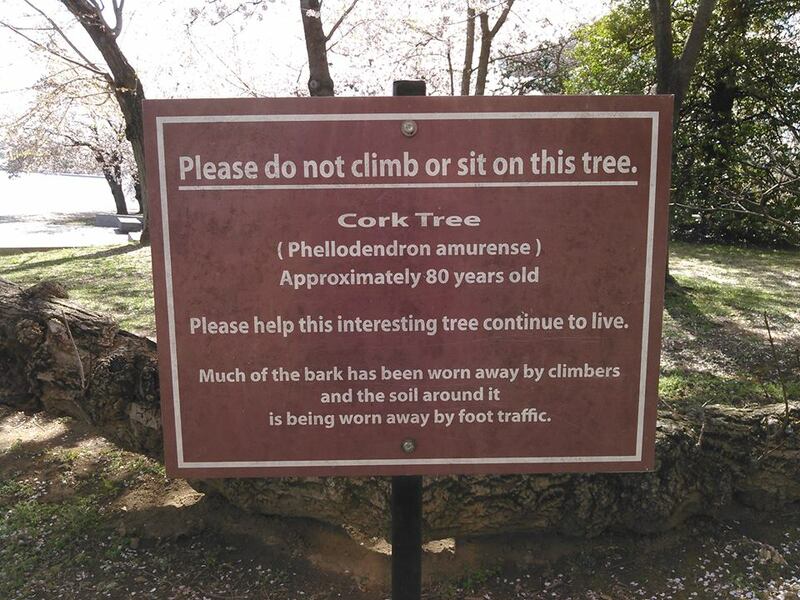 But perhaps the most interesting of the other trees is an Amur cork tree on the south side of the Tidal Basin (MAP), between the water and The Franklin Delano Roosevelt Memorial. Having been planted over 80 years ago, these trees are old enough to have witnessed the construction of the nearby The Thomas Jefferson Memorial, and its dedication back in 1943. The Amur cork tree, or the Phellodendron amurense, is a species of deciduous tree in the family Rutaceae named for its thick corky bark. Native to eastern Asia; northern China, northeast China, Korea, Ussuri, Amur, and Japan. The tree is a major source of huáng bò, one of the 50 fundamental herbs used in traditional Chinese medicine. What I find most interesting about the Amur cork tree, however, besides its unusual appearance, is that it is considered invasive and even an ecological threat in North America. The National Park Service, who overseas the area around the Tidal Basin, originally introduced it to the environment. However, the Park Service’s own guidelines state, “The best way to control Amur corktree is not to plant it in the first place.” It’s a contradiction that seems typical for the Federal government.